When I first heard Dr. Bernstein speak about amylin, I was shocked. How come I had never heard of this before? People with type 1 diabetes lose amylin production when our beta cells stop functioning. Amylin is a hormone made by the beta cells that controls how full we feel after eating. It also slows stomach emptying and helps to control the blood sugar increase normally caused by glucagon. And for those of us with type 1 diabetes, this is all compounded by the loss of amylin. Many of us are finding that we are not eating the micro- or -macronutrients that we think we are, potentially leaving us with many dietary pitfalls that can cause excess hunger and overeating. The Ketogains calculator can help you determine your daily food needs based on your goals of weight loss or muscle gain. Ketogains uses similar macros to Dr. Bernstein's recommendations. Then use an online food log such as Cronometer.com to log your foods and determine where you might be deficient based on your Ketogains goals. Using the Ketogains calculator listed above, you can determine how much protein you SHOULD be eating. Dr. B recommends that most physically active adults consume 1-1.2 grams of protein per kilo of ideal body weight. Children and athletes may need considerably more protein than this. Iron-deficient anemia (low iron levels in the blood) can cause extreme cravings that lead to overeating and out of control blood sugar levels. A simple blood test and iron supplementation can diagnose and treat low iron levels. We often reach for food when we really need hydration. Water, hot tea, iced tea, (sweetened with stevia or erythritol, if needed), unsweetened almond milk and broth are all great choices. Read the labels for anything you're consuming to make sure they don't contain hidden sweeteners, grains or maltodextrin. Drinking a large glass of liquid BEFORE eating can also help you feel more full and avoid overeating. Measure all of the food you will be eating into appropriate servings and put in separate containers. Then you can take the container at mealtime to heat and serve (this works great for lunches in particular). This way, you're not tempted to grab another serving of something or go out for a big meal at a restaurant. Your food is already prepared, in appropriate portions and you don't have to think about it. If you're not in the kitchen, it's 100x easier to avoid overeating. Once you're done eating your pre-measured portion of food, grab a big glass of water or low/no calorie beverage to sip on and leave the kitchen! Leave the dishes. Take the dog for a walk, go to another room to distract yourself until the feeling of hunger subsides. Whatever you do, just LEAVE THE KITCHEN. This means to go without one meal during your day. For most, that means breakfast and it's also a perfect time for basal testing. This time without food helps your body to feel real hunger and also re-set your body. Personal story: If I eat in the morning, I'm starving by 10 AM and need a snack. If I don't eat breakfast, I can fast from dinner the night before and until lunch the next day with no problems (15-18 hours) also saving an intake of 500 calories between breakfast and an AM snack). **Please note that with any fasting, you will need to test your blood sugar often and have glucose tablets at the ready for possible hypoglycemia. If your blood sugar drops during this time, it means that the timing and/or dosage of your basal insulin is off and needs to be adjusted. A properly adjusted basal rate will keep your blood sugar steady all day long and you will not have to eat at certain times of the day. Sit down, pay attention to your food. Look at it, notice the color and texture. Smell it. Taste it. Eat slowly and think about every bite you're eating. It sounds silly, but it can really help you to slow down and focus on the food you are putting into your body. In Dr. Bernstein's Diabetes Solution book, he outlines a method that with regular practice, can help you to curb cravings and stop overeating. It is detailed in Chapter 13, page 206 of Dr. Bernstein's Diabetes Solution book (Little, Brown and Company, NY 2011). 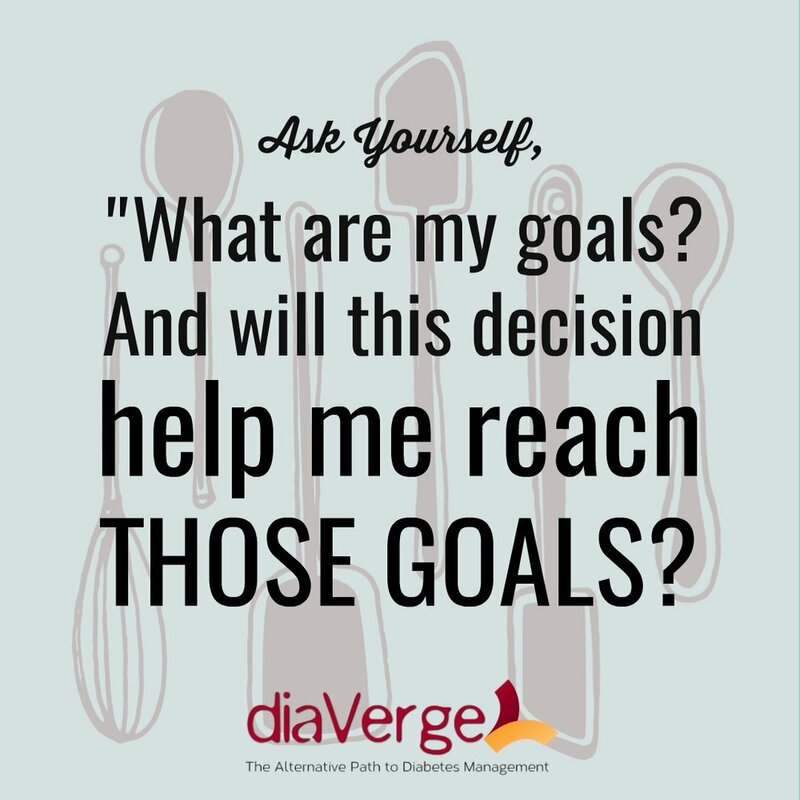 When you're about to eat something, ask yourself, "Does this help me reach my goals?" Oftentimes, the answer is no, and you can move on. Both medications are available by prescription and can help curb your appetite, lower your blood sugar levels and ultimately, help you lose weight. Contrave contains 2 medications in one: Naltrexone which is used for anti-addiction and Wellbutrin, which is an antidepressant. Contrave blocks the receptors in the brain that fuel addiction and many report much less hunger as a result. Symlin (generic pramlintide) is a synthetic form of Amylin, which we lose when our beta cells stop functioning. As mentioned above, this is the hormone which helps us feel full after a meal and tells us to stop eating. Symlin is available via injection that you need to take 30 minutes before eating a large meal. It can cause hypoglycemia and should be used with caution. What helps you to stop overeating? What have you tried in the past? Tell us all about it in the comments here and help us support each other! Subscribe to learn more about our low carb diabetes courses launching March 1! If you need help with motivation, changing your habits and truly moving towards a healthier, happier you, please visit our coaching page. We can help you reach your goals with one-on-one coaching and problem-solving, meal planning, shopping lists, recipes and regular chats to help you stay accountable. If you have not yet purchased Dr. Bernstein's Diabetes Solution book, click here to purchase on Amazon. **This post contains affiliate links. If you purchase through these links, we receive a small commission that helps to support our blogging and diabetes advocacy work, while not costing you anything additional. diaVerge.com does not accept paid sponsorships and will only recommend items that we use and love.